Scientists at the University of Southampton have discovered that a region on the front surface of the eye harbours special stem cells that could treat blinding eye conditions. This part of the eye is called the ‘corneal limbus’ and is a narrow gap lying between the transparent cornea and white sclera. 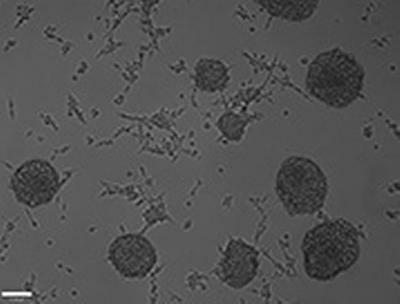 The research, published in PLOS ONE, showed that stem cells can be cultured from the corneal limbus in vitro. Under the correct culture conditions, these cells could be directed to behave like the cells needed to see light - photoreceptor cells. The loss of photoreceptors cells causes irreversible blindness and researchers hope that this discovery could lead to new treatments for conditions such as age related macular degeneration, the leading cause of blindness in the developed world which affects around one in three people in the UK by age of 75. Furthermore, these stem cells also exist in aged human eyes, and can be cultured even from the corneal limbus of 97 year olds. Therefore this discovery opens up the possibility of new treatments for the older generations, researchers believe. The research was funded by the National Eye Research Centre (NERC), Rosetrees Trust, T.F.C. Frost Charity and the Gift of Sight Appeal.